One could be excused for thinking it has been uncharacteristically quiet in regards to the creeping Goonswarm campaigns in Pure Blind, Fade, and Deklein recently. Largely on account of the fact that mentioning one-way GSF kamikaze fleets of high damage dealing yet cheap and replaceable Tech-1 Cruises such as Moas and Caracals hardly merit acknowledgement, and the No-Shows (or “Blueballs”) as regards to many final timers that are often hyped and formed for (two in a row, just this March 22) with nothing to show for it (Except for a decent fight this reporter recorded against some INIT. Macharials ), would be but the exact reaction the Mittani’s sleepless minions are seeking judging from the history of psyops the GSF typically employs when seeking to wear an opponent’s membership down. Although, when they attack an undefended and abandoned Pandemic Horde fortizar instead of the two that had defenders standing by, then spam local with the killmail… amusement is had for altogether the opposite reasons. This past Monday, it was GSF hunters who took it in jugular when they suffered over 34 billion in losses for just a solitary Rorqual and some subcaps in exchange. For several weeks now residents of the GOTG inhabited North can expect dozens of GSF characters scattered throughout the more populated systems in the region. Typically in cloaky ships, lurking about, most likely afk 90% of the time, not responding to chat in local (I guess the only quiet goons are the bots eh? ), harmless until someone takes the helm and starts hunting. The idea is to let the residents of the adjoining systems get used to the character in local, and then suddenly go active to catch a big fish unawares. The GSF hotdroppers are staging for the most part out of the 2 NPC stations in ROIR, though they have yet to successfully anchor a citadel in the system since recent operations prior to the controversial battle for Pandemic Horde’s Keepstar Class Citadel in 9-4RP2 erased those that had been present there beforehand. 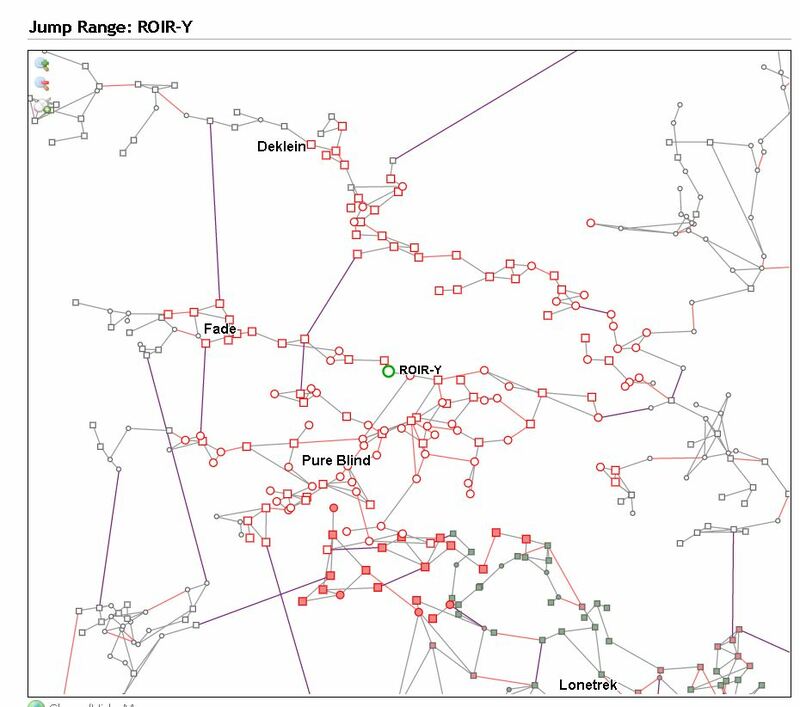 Some smaller GSF citadels are, however, in surrounding systems with less jump range into Deklein. The ROIR NPC stations, while very vulnerable to the bubble camps which any veteran player active before the Citadels update will agree used to be endemic, are still useful bases… at least until someone gets around to organizing a 24-hour hellcamp. Stealth fleets taking advantage of covert cynos have the range to strike most GOTG strongholds in Fade, Pureblind and Deklein. With the departure of the Pandemic Horde Alliance from the North, GOTG remains the primary power in these areas, although several other groups, such as Banderlongs Alliance , Old School, and French ConneXion are also currently active in Pure blind particularly. While it’s inevitable that people who fail to read Intel channel that bombers and dreadnoughts have been seen undocking yet carry on with PVE will inevitably get blown up, the recent failed goon whale hunts involving capitals is a sterling example of the potential hellstorm awaiting GSF vets harboring quaint dreams of a Northern comeback. Seeking perhaps to improve on their modest success, about an hour later, the same fleet this time reinforced by 6 dreadnoughts and a battle rorqual hotdropped a solitary ratting Hel in YAO-XJ that resulted in rather more pleasing results for the GOTG side. The Hel pilot ( A Member of one of SLYCE’s Renter corps) was apparently quite properly fit, and was able to secure an FC to lead a response quickly enough to turn the tables, effectively wiping out the attackers. That these losses can be replaced in a matter of days by GSF is common knowledge, whether their dreadnought pilots can be asked to show up repeatedly for such treatment over the long term is another story altogether. On a strategic level, this reduction in Jump fatigue may induce smaller groups to try their hand at taking and holding Nullsec space, as capital ships, the “Big Guns” of fleet PVP will be moving about much more frequently. Conversely, it will significantly reduce the time invaders (Or certain raiding groups I don’t feel the need to mention by name) have to spend carrying out and recovering from move ops before appearing of nowhere with dozens of supers in the heart of enemy space. When combining these new mechanics with the fact that all citadels can now be put into a 1st reinforcement timer at any time, we may just have a recipe for a more fluid Nullsec sovereignty map or goes even further to enable entrenched residents to hold their space remains to be seen. That a small minority of GSF vets would love nothing more than to bask in the Reddit karma presumably associated with a return to their olde-time haunts and erase the stain of the memory of its loss is no secret. Whether the vast majority of GSF members with no memory of living anywhere outside of Delve care one way or another is highly debatable. 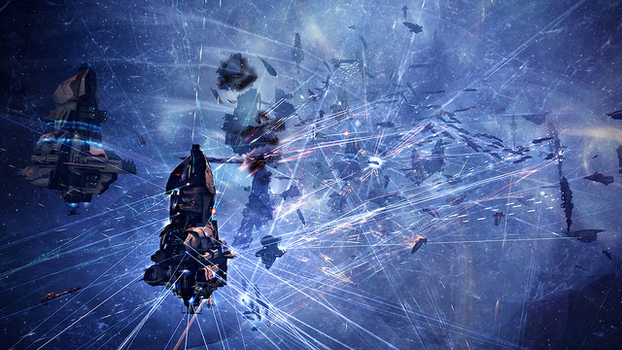 If trading 6 billion in losses for a Rorqual Kill then whelping several capitals that should have had no real challenge in erasing a Hel after a mere handful of volleys yet falling flat in the effort is any indication of how GSF intends to retake it’s ancient stomping grounds, then there will be more than a few smiling faces on the defending side of the fence. excellent issues altogether, you simply gained a logo new reader. What could you suggest about your publish that you simply made a few days in the past? Any positive? Considering that the MSM is entirely manipulated, what blogs/websites have you located that offer you details that the MSM neglects?. Really my blog name is not relevant to my blog site specific niche. in this time i wish to convert my blog site to a web site through blogger. however i do not know if i will do it, after that how much will impact my blog web traffic?.